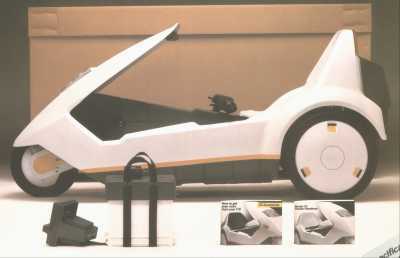 The electric car was one of Clive Sinclair's pet projects, into which he channelled some of the profits from his computer range, and it reached the market early in 1985. The Sinclair C5 was intended to be the first in a range of electric vehicles, with later models being larger and faster. The stated aim, according to the launch brochure, was that the C5 would replace conventional petrol engined vehicles for local journeys, being cheaper to run and less polluting. There had already been several attempts (mainly by established car makers) to produce electric cars but these were all based on the idea of taking a standard car and trying to fit enough batteries to propel its weight to something approaching normal car speeds. The result was expensive to produce, heavy, and probably no cheaper to run overall than a petrol version. 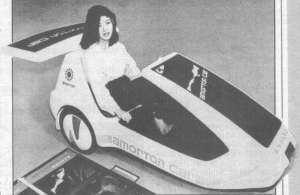 Clive Sinclair's solution was to go for a small, light, single-seat vehicle with a low top speed, which could then be powered by a small motor and a single high performance car battery. The C5 body, chassis and battery. The C5 was carefully designed to minimise rolling resistance and aerodynamic drag and hence the power needed to propel it. The result was certainly a sleek and interesting appearance. Road traffic legislation meant that electric vehicles below a certain power and top speed were exempt from a licence, road tax or insurance, and the C5 took full advantage of these rules. Its 250 watt 12 volt motor gave it a top speed of 15 miles per hour on a level road, and the lead-acid rechargeable battery was claimed to provide a range of 20 miles. The C5 used a deep-discharge battery which could be recharged in eight hours, and it was possible to carry a second to extend the vehicle's range. Drive was via a combined DC electric motor and reduction gearbox giving a single speed. A button on the handlebars switched the motor on and off. Pedals and a chain drive were also fitted for if the battery went flat or for an extra boost up hills. The C5 was sold by mail order at £428, including delivery, and arrived in a cardboard box. The motor was built by Hoover and their engineers were to perform servicing. What you got for your £428. By far the greatest concern was that the low seating position meant the C5 was almost invisible in traffic. Even when Sinclair supplied a high level rear reflector on a pole, few people would be willing to risk the C5 on a main road. The actual range of the vehicle was less than the twenty miles claimed, being closer to ten miles, particularly in cold weather which reduced the battery's output. The C5 weighed about 45 kilograms, much heavier than a bicycle, and the 250 watt motor struggled to propel it up hills. Pedalling frequently had to be resorted to but the high weight and fixed (low) gear ratio made this laborious. There was little luggage space (enough for about two carrier bags) so even its promoted use for shopping trips was in doubt. Although the aim of a cheap and environmentally friendly form of transport was laudable, the C5 was not the answer. Only if there were no internal combustion engined vehicles on the roads might it have been a success. Clive Sinclair had clearly expected it to be as big a success as his ZX81 and ZX Spectrum computers, but in the event only about 17000 were made and they were very rarely seen. Development had cost £7 million and the failure of the C5 was one of the reasons the Sinclair computer business was sold to Amstrad in 1986. 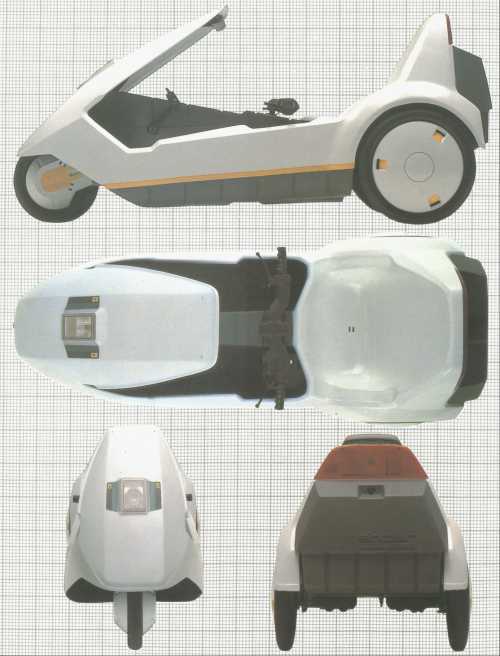 Clive Sinclair did not abandon the electric vehicle business altogether though and in 1994 he launched the Zeta, which was a battery-powered drive unit which could be fitted to a standard bicycle to reduce the amount of pedalling needed. This was a much more practical design than the C5 and has been moderately successful. Brakes Front: cable-operated caliper brake with high performance blocks. Rear: cable-operated twin-shoe hub brake on off-side wheel with parking brake provision. Front: 317 mm (12½") dia. unique nylon composite wheel with 317 mm (12½") x 57 mm (2¼") low rolling resistance tyre. 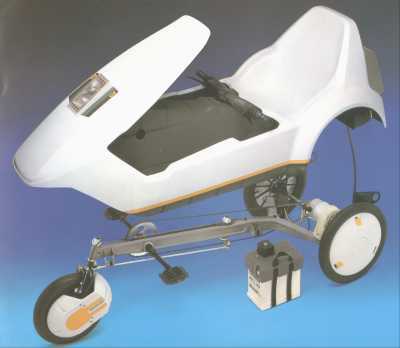 The Sinclair C5 service network provides the highest quality of after-sales service, and maximum convenience through an established national organisation with a proven record of customer service - Hoover. The Hoover Company has been servicing electric appliances at customers' homes for over 50 years; the selection and training of their service staff is so exacting that their work is fully guaranteed for 12 months. For free advice, or if you require a service engineer to call, contact your local Hoover Service Office. The address and telephone number is in your local telephone directory.